The tug FFS Achilles sank after grounding off Skjolnes, Norway. The vessel was en route to Farsund, but hardly stuck at rocky shallow near the fjord and started getting water ingress. The crew was unable to get control over the flooding and reported the accident to the local authorities. 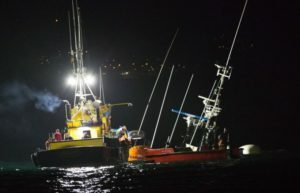 At the scene of the troubled vessel was sent lifeboat, which evacuated all the three seamen. The tug FFS Achilles partially sank south off Fisholmen, but authorities and company operator Farsund Fortoyningsselskap are working on a salvage plan. There were no reported injuries, but on board of the vessel there are several tons of diesel fuel, which might spill in the water near the fjord and salvage is mandatory due to environmental danger. The local authorities are working closely with company for the salvage and refloating the tug. Fortunately during the accident there were no reported injuries and no water pollution. “We do not yet know what has happened, except that the vessel ran aground and sunk as result of water ingress. Now the vessel is fully submerged, but we are working on a salvage plan. The area is monitored to check for contamination, but there were no reports of oil leaks from the tug”, said the general manager of Farsund Fortoyningsselskap, John Willy Nilsen. The tug FFS Achilles (IMO: 8224523) has overall length of 30.20 m, moulded beam of 9.75 m and maximum draft of 4.60 m. The deadweight of the vessel is 145 DWT and the gross tonnage is 285 GRT. The tug was built in 1984 and operating under the flag of Norway.